As part of Partech ongoing commitment to providing the very best instrumentation for water and wastewater monitoring the 740 Portable Suspended Solids Monitor has been made obsolete. • Multiple sensor options – The initial product will be available with 4 interchangeable sensors for Suspended Solids, Turbidity and Sludge Blanket. • Future developments will include DO, pH, REDOX and EC (TDS) Sensors which will be compatible with existing 750w² units using a quick firmware upgrade. • USB connectivity – For uploading firmware to support additional developed functionality, downloading Data Records and charging via any compatible USB point. • Data Records – Record up to 500 data points per sensor and download the .csv via USB to PC – no software required. For full and detailed specifications please see www.partech.co.uk or contact our sales team. 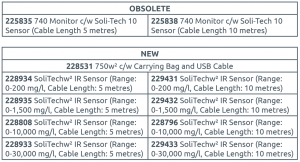 The 740 Portable Suspended Solids Monitors and SoliTech10 Sensors will be supported under Partech’s 24 month warranty as standard but will no longer be available for purchase. Any questions about this post please do not hesitate to contact us.